As Fall quickly approaches, we all start to notice the trees a little more, becoming flush with yellows, reds and oranges, reminding us that Winter is not too far away. Many people instinctively break out the shovel and trough in the Spring to plant their trees, but planting your tree in the Fall can be as great a time for it (or even greater!). Your tree will have two extra seasons (Winter and Spring) to establish itself in the soil before the heat stress of Summer sets in. Here's a good primer to start your way to planting that tree you've been meaning to plant! Trees of all species usually come from a nursery or garden store in one of three different ways: balled-and-burlapped, bare-root, or potted. Bare-root trees are usually considered the best, mainly because the majority of the tree's roots remain intact, and will have the easiest time acclimating itself to its new home in your yard or street. Balled-and-burlapped trees, also known as "B&B's", are perhaps the most commonly-seen, ready-to-be-planted forms. However, they come with the least of its original root-system intact--up to 90% of its roots were severed when it was dug up from a nursery and balled and burlapped. These will need extra watering vigilance as you try to establish the tree in its first year. Potted trees, when purchased young enough, can be excellent as well. Assuming you already know which species of tree you'd like to plant, make sure to pick a sunny, well-drained patch of earth, clear of any possible aerial obstacles like power lines or other trees. Planning where a tree should go should be no small decision: they can live and thrive for decades, quickly out-growing any cramped space. A well-placed tree can shade your house during the hottest of days, saving on energy costs for years to come. When you've picked your patch of earth, start digging--but not too deep! The number one mistake perpetrated when planting trees is planting them too deep--the vast majority of a tree's roots will be within a foot of the soil surface, and planting a tree too deep at the beginning will diminish its ability to receive oxygen or water from the surface. The root flare--the bump on the lower part of the trunk where the roots begin--should show above the surface. You can lower the tree into the hole to gauge how deep it is as your digging, or you can take a tape measure to be more precise. Dig the hole at least two times wider than the root ball is: since these roots will be primarily growing out instead of down, loosening up this soil is crucial for the roots to establish themselves. When you've reached the right depth, place the tree in the hole, making sure it is positioned as straight-up as possible. If it is a B&B, do remove the burlap and wire basket at this point, otherwise the roots will twist around and stunt the growth of the tree, if not eventually strangling and killing it. 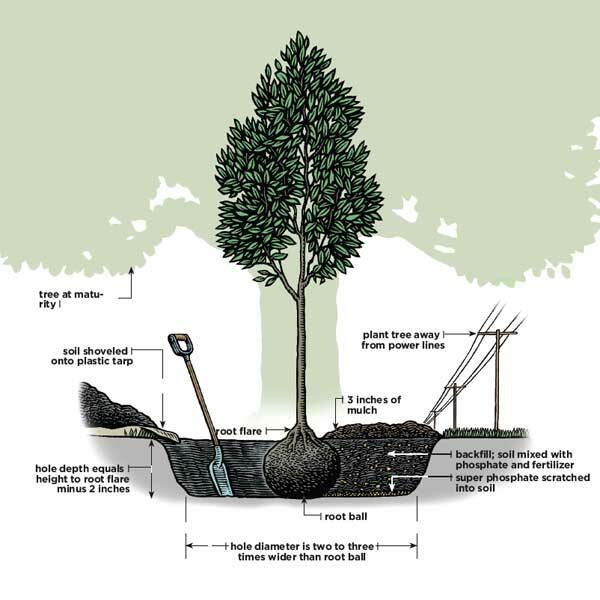 If you have a bare-root tree, place an extra mound of soil in the hole upon which to lay out the roots radially, still making sure the tree will be at the right depth when you backfill the rest of the hole. Make sure to backfill the rest of the hole with as much of the original soil that you took out of the hole as possible. When mulching, it is much better to mulch wide and not deep. Mulch no more than 3 inches deep and make sure to not have the mulch actually touching the tree trunk itself. 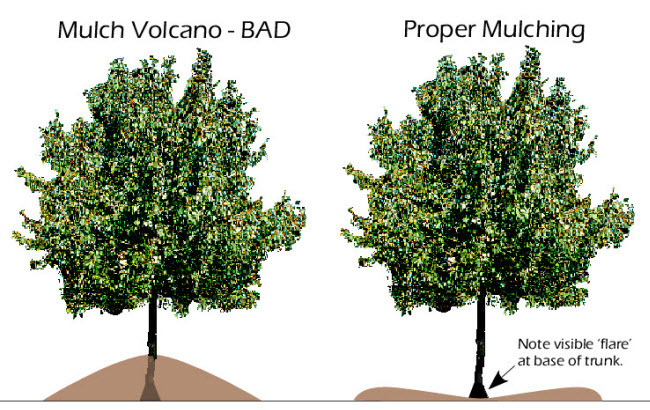 Avoid piling the mulch high up against the tree, a practice infamously known as the "mulch volcano." This can trap moisture against the tree, encouraging rot, or preventing water from infiltrating down to the roots at all! Water the tree generously right at planting, and every few days after. About 5 gallons at a time will do. A best practice is to use a 5-gallon bucket with a few holes punched in the bottom: place the bucket next to the tree, fill it up, and let it percolate down into the soil. For more info on planting a balled-and-burlapped tree, click here. Insect in the garden. Moth?